Now is the time to keep your eyes on the monetary endgame. Not the daily mark-to-market in paper gold. This endgame is an all-out attack on the status of the U.S. dollar as the benchmark global reserve currency. Numerous players have an interest in ending the dollar’s role for reasons ranging from climate change (global problems require global money solutions), to geopolitics (Russia and China both have regional hegemonic ambitions in Eastern Europe and East Asia respectively). As investors with longer horizons and patience, we see ways to profit from these global macro trends. We’ve done the deep-dive you need to see the big picture. All indicators show this is an excellent time to accumulate a position in gold, if you haven’t put 10% of your investable assets in gold and physical metal already (which is what I recommend). Whenever a new president is elected, think tanks in Washington get to work writing transition papers for the new administration. These are compilations of policy advice from subject matter experts for the benefit of the president-elect’s transition team. I was invited to contribute to a transition paper on national economic security. This is the policy area with geopolitics and global capital markets converge. I was invited by a non-partisan institute called Center on Sanctions and Illicit Finance, part of the prestigious Foundation for the Defense of Democracies. It was founded by Jack Kemp and Jeane Kirkpatrick and other patriotic Americans concerned about the rise of authoritarianism, and the decline of freedom and liberty. A major blind spot in U.S. strategic economic doctrine is the increasing use of physical gold by China, Russia, Iran, Turkey and others both to avoid the impact of U.S. sanctions and create an offensive counterweight to U.S. dominance of dollar payment systems. Currently U.S. dollar-denominated instruments and transactions constitute about 60% of global reserves, and 80% of global payments respectively. The U.S. monopoly of power over dollar payment channels gives the U.S. unrivaled dominance over the international monetary system and the economic well-being of every nation on earth. Adversaries naturally chafe at this immense power especially in light of U.S. imposed sanctions that are considered overbearing and unjustified by the targets. Those adversaries do not issue currencies that are potential alternatives to the dollar because of inadequate rule-of-law, immature bond markets, primitive capital markets infrastructure, or all three. The only feasible alternatives to dollar dominance are special drawing rights (SDRs) issued by the IMF, and gold. To prepare for a physical gold alternative to the U.S. dollar, Russia increased its gold reserves 280% from the first quarter of 2006 to the second quarter of 2016 (from 386.5 metric tonnes to 1,498.7 metric tonnes), while China increased its gold reserves 203% in the same period (from 600 metric tonnes to 1,823.3 metric tonnes). China has been consistently non-transparent about its activities in the gold market. Based on China’s mining output and reliable data on gold exports from Hong Kong and Switzerland to China, there is good reason to conclude that China’s actual gold holdings are nearer 4,000 metric tonnes, (a 567% increase since 2006). The comparable increase for Turkey is 308%. Reliable data is not available for Iran, however, exports from Turkey and Dubai to Iran are significant, and there is good reason to conclude that Iran is also a rising gold power relative to the size of its economy. Russia, China, Turkey, and Iran constitute a new “Axis of Gold” prepared to undermine confidence in the U.S. dollar. Gold offers adversaries significant benefits in a world of U.S. imposed dollar-based sanctions. Gold is physical, not digital, so it cannot be hacked or frozen. Gold is easy to transport by air to settle balance of payments or other transactions between nations. Gold flows cannot be interdicted at SWIFT or FedWire. Gold is fungible and non-traceable (it is an element, atomic number 79), so its provenance cannot be ascertained. The U.S. is unprepared for this coming strategic alternative to dollar dominance. No sooner had I submitted this analysis than President Erdoğan of Turkey made the following remarks in response to a currency crisis in his country: “Those who keep dollar or euro currency under their mattresses should come and turn them into liras or gold.” Turkey is not only accumulating large gold reserves, it is also a major transshipment point for gold flowing illegally to Iran. Evidence for the rise of this Axis of Gold is overwhelming. Right now gold mining output is flat, western central bank sales of gold have ceased, and acquisition of gold by the Axis is increasing. In India, a mad scramble for physical gold has begun because the government has declared most forms of cash to be illegal. The Indian government may not like gold (they have been seizing it from private hands), but the Indian people are wiser than their government. Indians are buying as much gold as they can through legal and illegal channels. With limited output, limited western sales, and huge eastern purchases, it’s only a matter of time before a link in the physical gold delivery chain snaps and a full-scale buying panic erupts. Then the price of gold will soar regardless of paper gold manipulations. However, it may be too late for investors to benefit because the ready supply of physical gold will be gone. The time to take a position is now. When will this buying panic erupt? What signs can we look to for guidance? The most important input is the gradual dumping of U.S. Treasury debt by foreign creditors of the U.S. These market participants are highly sophisticated. They know they cannot dump all of their U.S. debt at one time without causing a panic and hurting their own positions. This graph is revealing not only because of the gradual reduction of U.S. Treasury holdings by foreigners, but also because of the extremely high level of such holdings. Some countries such as Japan are highly indebted, but the debt is held primarily by their own citizens who have no interest in attacking their own government. That’s not true for the U.S. We are extremely vulnerable to foreign attack because of the high percentage of foreign ownership — almost 40% of the market. The second major indicator is the run-off in China’s reserve position. China’s reserves have collapsed from over $4 trillion to about $3 trillion in the past 30 months. This decline shows no signs of stopping; in fact it has accelerated lately to the point that China is now imposing capital controls. 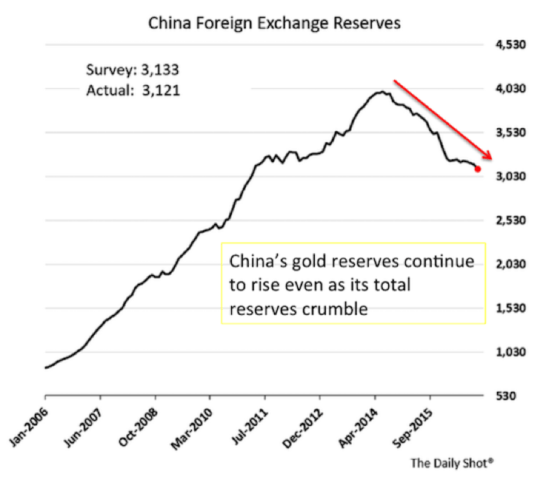 What is revealing about this is that while total reserves have been collapsing, gold reserves have been going up. China has been buying thousands of tons of gold even as they sell U.S. Treasury bonds to pay offshore creditors and prop-up their currency. Indicators all point in the same direction – Treasuries are being dumped and gold is being acquired by the largest investors in the world. This is being done not as a “day trade” but as a strategic geopolitical move. This means these trends will continue until the aims of the Axis of Gold have been achieved. Those aims include the overthrow of the U.S. dollar as the benchmark global reserve currency. 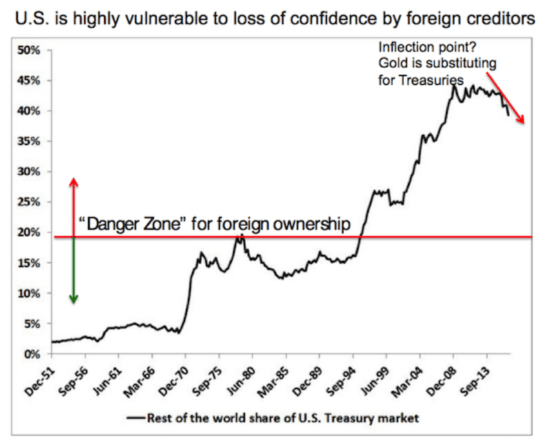 When that happens, collapsing confidence in the dollar will send the dollar price of gold skyrocketing. But you do not have to wait until the final collapse of confidence in the dollar to benefit. Momentum will accelerate long before the endgame, giving early investors ample opportunity to profit from the trend.